Greenification of electrical distribution systems and equipment can actually enhance reliability if we design from a green-friendly lens. For the purposes of this discussion, reliability means being able to depend on a stable supply of power to support the functionality of homes, institutions, businesses and essential service providers in our communities. A fault in the electrical distribution equipment can shut power to the entire infrastructure because the currently accepted designs do not focus on energy conservation but on continuing with traditional approaches to power distribution. These traditional approaches tend to have one main disconnect, usually located in the basement, that controls power for the entire line up of equipment. 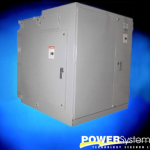 In a high risk episode such as flooding, a power distribution system has to be shut down. This means the power supply for the entire building or consortium of buildings will lose all power. Losing all power means impacting the entire functionality of the respective building in question. From an energy efficiency stand-point, or a greener perspective, this constitutes a loss. It takes energy to power equipment on and off in buildings which includes HVAC system losses which are often overlooked. In relation to reliability, we can all agree that economic disruptions stem from non-operational buildings which require power to house people to work, if nothing else. After all, people need power in a building to do their jobs. The monetary losses from this traditional approach to energy distribution design do not take economic-losses from power shut-downs into enough consideration. Traditional designs require that an entire building shut-down for regular scheduled maintenance. Furthermore, if any faults occur within that main distribution, the building or consortium of buildings would be down for a significant period of time. This is a major inefficiency preventing the full operational purpose of the building in question. We at Power Systems have created a greenified distribution system, called Green DPS, to overcome this issue of significant downtime. Our Green DPS is designed with intentional redundancies in place so that a fault in the electrical distribution network can be isolated without additional energy losses. This garners less disruption to the operational functioning of a building or consortium of buildings while enhancing greenification. If you would like to learn more about Green DPS, or would like to contribute to this discussion, we welcome your input.